Patrick Jacob is a Arizona native out of Peoria, AZ. He is working towards his B.A. in Music Education at Arizona State University. 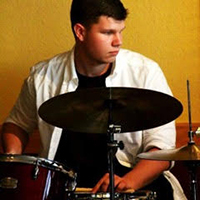 While his primary instrument is percussion, he is also a member of ASU’s winds and steel band ensembles. When he isn’t playing drums or cracking a great joke, he is the Assistant Band Director in the Scottsdale Unified School District and has strong knowledge of marching band, concert and jazz playing. He has a true passion for teaching others and we’re so lucky to have had Patrick with us since 2017.